Mark areas of interest and record fleet vehicle movement to improve daily operations, track fleet performance, improve asset security, and validate policy execution. 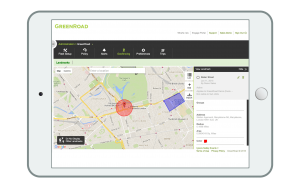 Set up landmarks and geo-fenced areas using your GreenRoad portal to monitor driver entry and exit from worksites or restricted areas. Measure time spent at the office, warehouse locations, and customer and construction project sites. Discover unauthorized fleet vehicle usage. Set specific fleet schedules and track arrivals and departures of teams to work sites or construction projects. Limit fleet travel and vehicle usage to specific areas. Identify areas of concern while reviewing fleet performance on your GreenRoad Central web portal using fleet trip history, fleet live map, or fleet hotspots. Or set a list of landmarks by importing a list in CSV format manually or automatically via the GreenRoad API.